Hequ, or Hequl, horses are found in the Qinghai Province of China and are used as a pack and draft animal as well as for riding and racing. Hequ means "river zig." They originated in the border area of Qinghai, Sichuan, and Gansu provinces where the Yellow River makes a large "zig." Prior to 1954 the breed was known as Nanfan which is often misapplied to the Tibetan horse. During the T'ang dynasty the Hequ horse was a favored spoil of war in the region. During the T'ang dynasty (618-917) the emperor established a large horse facility to develop the calvary. To do so he imported large numbers of horses from western Asian countries to use on the local Tibetan stock. Chief among the breeds influencing the Hequ were animals imported from Dawan. Dawan was the ancient Chinese name for the kingdom that included Fergana, home of the Akhal-Teke breed. During the Yuan dynasty (1279-1368), Mongols of the Xianbei tribe invaded the area resulting in Mongolian stock being mixed with the Hequ. The Hequ breed's native area is at 11,000 feet in altitude where temperatures are low but the climate is temperate and moist during the summer. Mares mature at two years of age and are usually bred at three. Conception rate is generally around 70% but improved nutrition and care can result in rates as high as 80-90%. Mares sometimes produce twelve to thirteen foals during their lifetime. The breed is classified as a draft-riding animal, solid but coarsely built. The Hequ may be black, brown or grey. There are three varieties of Hequ horses. The Jiaode type is found mainly in the southern parts of Gansu province. These horses are rougher in constitution and have a larger, courser head. The hooves of the Jiaode are also not as strong. The Jiaode is found mainly to be grey and stands about 13.3 hands. The Suoke type is located in western Sichuan province. This variety has a relatively large head and ears and a short loin. The Suoke carries its tail very high as did the ancient T'ang horse. The Kesheng is found in Kesheng Mongolian Autonomous Region in the province of Qinghai. 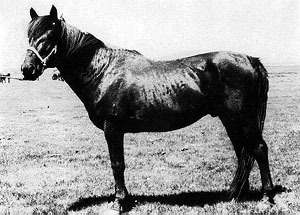 The breeding of the Kesheng is mixed with Mongolian horses.